Rockies; snowshoe trekking trips, tours, weekends and vacations in the Alps, across Europe, in North America and Worldwide. Snowshoeing holidays in Europe – hotel-based trips with daily guided snowshoe tours through dramatic mountains and beautiful snow covered landscapes. Snowshoeing is rather like winter walking, it's fun, easy to learn and requires no previous experience. 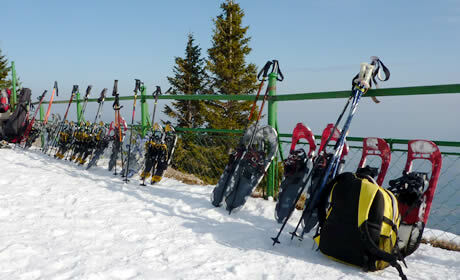 Also winter activity holidays which include snowshoeing along with multiple other winter activities. Guided snowshoe holidays in Scandinavia and Europe. Also winter activity breaks which offer opportunities to try a range of different winter sports including: snowshoeing, cross-country skiing, alpine skiing and husky dog sledding. Discover the New Zealand backcountry on snowshoes. 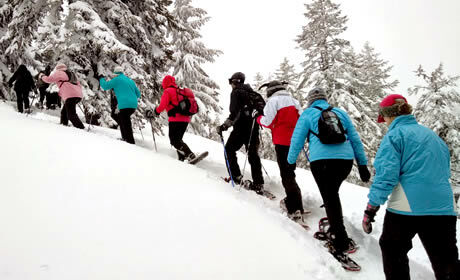 Offering a range of snowshoeing adventures for all ages, abilities and fitness levels. Options from half day intros to multi-day backcountry tours. Fully customizable, tailor made, activity and adventure holidays in the mountains and great outdoors. Offering a wide range of trips for all seasons and a range of activity levels; trips for families, couples, friends groups, businesses, clubs or schools. From walking to wildlife and cycling to skiing and winter sports. Outfitters and guides with backcountry ski huts and yurts in the mountains near Sun Valley, Idaho. Guided snowshoeing vacations in the wilderness of New Mexico, in the Sangre de Cristo Mountains near Taos. Summer walking and winter snowshoeing tours exploring the beauty of Iceland. Tours go from Akureyri in the north, a area of beautiful changing landscapes. A snowshoeing adventure through the snow-covered mountains of the Picos de Europa National Park, on snowshoe trails in the West, East and Central Massifs. Enjoy wonderful dramatic landscapes, visit the Basilica Santa Maria, see the stunning glacial lakes of the Western Massif, ride the longest unsupported cable car in the world, visit remote and picturesque high mountain villages and wonder at a dramatic 1 km deep, 12 km long gorge. The travel-quest snowshoeing holidays and snowshoe tours section is intended for listing holidays, vacations, courses, weekends and short breaks where the main activity and focus is on snowshoeing or raquetting, including guided and unguided backcountry snowshoe tours in moderate country or on purpose built snowshoe trails, and off-piste and backcountry mountaineering snowshoe trips to higher terrain.